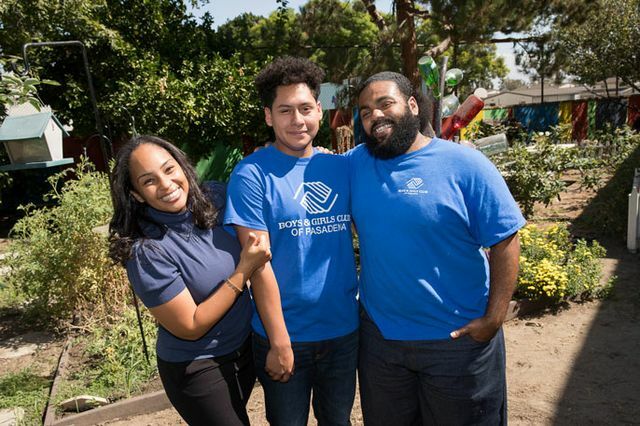 High school student Jose Palma (center) is aiming for college, with support from UCLA college adviser Britanny Lewis-Porchia and Boys and Girls Club of Pasadena teen director Steve Austin. Growing up in Pasadena, the Boys and Girls Club was where Britanny Lewis-Porchia made many of her fondest memories as a teen. So returning there to help the current teens prepare for and apply to college is a chance for her to come full circle. The University of California recently announced a new partnership with the Boys and Girls Clubs in Pasadena, Merced and San Francisco to bring its Early Academic Outreach Program to thousands of students offering one-on-one academic support and college advising services. The program, which already reaches about 42,000 California middle and high school students in their schools, has proven successful in helping them pursue higher education. Participants are significantly more likely than their classmates to take the SAT and complete the courses they need to be eligible for a California public university. More than 60 percent of 12th-grade participants go directly on to higher education, compared to an estimated 41 percent of California public high school seniors statewide. Now, UC is extending these services beyond public schools to reach students through community organizations. The pilot project is part of UC’s larger efforts to boost college-going rates across California. Boys and Girls Club members have higher grades and graduation rates, on average, and are more likely to avoid drugs and other risky behaviors than peers in their communities, according to data from the organization. 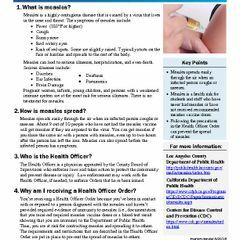 What they often lack is access to practical information on the nuts and bolts of getting from high school to a four-year university or community college. Pounds said that the partnership provides UCLA with another opportunity to work with students where they are, to help provide the access to and preparation for a UC education or other postsecondary institution all while cultivating a college going culture at the club. As part of the pilot program, the Boys and Girls Club of Pasadena is the only club UCLA is partnering with right now. “These innovative approaches in outreach will help to ensure we have a sizeable number of underrepresented minority students who represent all of California in the pipeline,” Pounds said. Steve Austin, teen director in Pasadena, who is known to the kids as Mr. Steve, added that the partnership offers a unique opportunity to reach kids through an organization they know and trust, free of the stresses, time constraints and peer pressures of school. Officials announce the new partnership between the University of California and the Boys and Girls Club. High school junior Jose Palma is one of those students. Palma arrives at the Boys and Girls Club of Pasadena early most days, long before the other kids. Whatever is going on at home or school, Palma knows he’ll find a warm welcome amid the sagging, overstuffed couches and pool tables from the supportive staff in the teen room where he hangs out. California Senate President Pro Tempore Kevin de León and UC Board of Regents Chair Monica Lozano announced the program Sept. 28 at the Pasadena club, hailing it as a model for expanding access to UC among low-income and underrepresented minority youth. 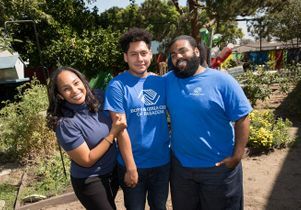 Through the partnership, three UC campuses — UCLA, Merced and San Francisco — will partner with their local Boys and Girls Clubs to offer personalized advising to teens to help them prepare for, apply to and pay for college. In its pilot phase, the program will serve an estimated 6,000 California students and their families at the Boys and Girls Clubs of Pasadena, Merced County and San Francisco. If successful, it could be expanded to include all 10 UC campuses and Boys and Girls Clubs across the state. Through the program, UC will train Boys and Girls Club staff to coach students. Participants will also have access to SAT prep workshops, tutorials on writing strong college applications and opportunities to visit UC campuses. They will also learn about UC’s strong financial aid program, which covers the full cost of tuition for more than half of UC’s California undergraduates. And they will find out about options for transferring to UC through a California community college. “Even though they have the academic ability, many of our students don’t see UC as within their reach,” said Damon Williams, senior vice president of Boys and Girls Clubs of America, which serves significant numbers of low-income and minority students. The partnership with UC, he said, is a potentially scalable model that will connect more economically vulnerable young people to a world-class university education. Said Boys and Girls Club official Joe Engelbrecht, who manages clubs in the Merced area: “We want to strengthen college-going knowledge and get them on campuses to have those exploratory experiences that will really open the lens of possibility for them. The relationship with Boys and Girls Clubs of America is part of Achieve UC, an effort launched by UC President Janet Napolitano to increase enrollment of California students and grow the percentages of underrepresented minorities pursuing UC degrees. Those efforts have helped the university this fall to welcome its largest and most diverse incoming class yet. For its part, the partnership allows Boys and Girls Clubs to provide services that can grow its teen membership. The Pasadena Club recently let its teen members design their own dedicated hangout space — including a recording studio and movie screening room. But officials also want to go beyond recreational and social offerings to provide educational opportunities that will have a long-term impact on the lives of their members. Teens like Palma are a prime example. “The trick is to find the spark that brings them here, and then talk to them about college and their future,” Austin said.